Karadjov stone is located in the Western Rhodopes, near. Bridge. He is a rock plateau with a height of nearly 4550 sq.m .. 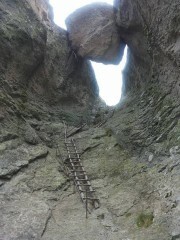 In its sheer cliffs formed a narrow chute, which is stuck with huge stone sizes. Under the stone there is a wooden staircase that is not very stable, but past it has a metal railing. There are places where the ladder stopped moving and became only the rock. The gap is 18 meters high and nachira locals Boaza. We need to be very careful especially when disembarking. When you reach the top of the plateau in front of you will find a unique view toward the Forest and Belintash. Exceptional experience will izpitate- wherever you look, the Rhodope Mountains are around you. Local residents do not want to talk much about Karadjov stone because it considered unclean place. Legends say that there was buried a great treasure, but residents say it is cursed and advise if some tourists find something to throw. To the phenomenon as long as you follow the path that is well marked and difficult to deviate. The path is towards the holy spring of Cross forest, but when you reach the fork for him to continue straight. You literally will run on the cliff of the mountain. Pass to forests, sloping and steep sections and after about an hour and 30 minutes to reach the phenomenon Karadjov stone. There is another alternative route - through the village bridge. It is strictly follow the markings, because of the difficulty of the section. Vertical drop of nearly 700 meters must be overcome. The time koetoshte you take this route is much more - between 3 and 4 hours. You should know that that route and to choose Karadjov stone is located in the territory of the famous with the population of bears Reserve Kormisosh. Be careful!